CBS News said its diversifying – adding a mix of women and minorities to its top staff and its upcoming 2020 election coverage. But, many are calling the “Eye” Network’s attempts at diversity an epic fail. 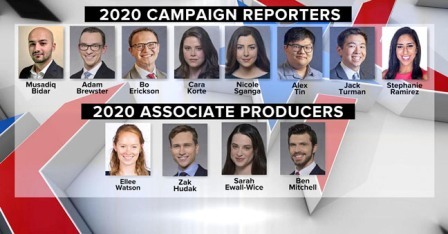 The network is taking some serious heat for excluding African-Americans from its core team of on-the-ground reporters and producers set to cover the 2020 presidential campaign cycle – an election that’s viewed almost universally as critical to Blacks and other minorities. Among the eight reporters, four reportedly are persons of color: Musadiq Bidar, a native of Afghanistan, Alex Tin, Jack Turman and Stephanie Ramirez. But, none are African American. “I think it’s appalling and absurd that CBS would put out a 2020 Election News Team without any African American representation,” said Danny Bakewell Sr., NNPA (National Newspapers Publishers Association) Chairman Emeritus and Publisher of Los Angeles Sentinel Newspaper and LA Watts Times Newspaper. “African American voters were the headline in election turnout in 2016, 2017, 2018 and will be a key campaign story to watch leading up to the 2020 election. It was such a mindless thought for CBS to exclude African Americans from such an important team, when it comes to news and information. CBS has such esteemed personalities and producers. Off the top you have Gayle King, Michelle Miller, Errol Barnett, Pat Harvey, James Brown, Jericka Duncan and so many others, in front of the camera as well as behind it. The NAACP, the nation's leading civil rights organization issued the following statement: “CBS News’ decision to not include Black reporters on their 2020 Election news team further proves the voting power and voices of Black America continue to be undervalued. As the voting bloc which will most certainly heavily determine the direction of this country in the upcoming election, it is vital any and all media outlets have a diverse newsroom, including individuals of color in decision making positions to speak to and address the issues and concerns directly impacting the Black community. Representation matters and the media needs our coverage on the issues to drive the discussion." CBS News noted that the embed team represented only a portion of its broader election coverage plans. Lorna Jones, who is African-American, was promoted last month to the role of managing editor for Washington news coverage, Variety reported.